This was the fourth year on the trot I've been at the Whitchurch Festival so the general outline is familiar - three days of music over the first weekend of August. The blues element has now gone completely and the majority of acts are either progressive rock or have some prog relationship. Even festival compare and local musician Keith Bell who opened proceedings managed to fit in Peter Gabriel and Van Der Graaf Generator songs, 'Mother of Violence' and 'Refugees', into his brief acoustic set. 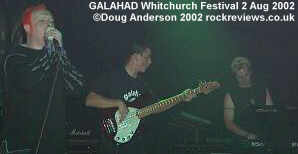 A few minutes after his musical performance Keith returned to launch the festival with a band I first saw as Keith also remembered "at the very first Whitchurch Festival in 1993", Galahad. Under cover of a smoke filled, though dimly lit, stage and introduction tape the band took their positions in front of the arc of expectant fans, an unrecognisable Stu Nicholson arriving last dressed in rather alarming attire of trenchcoat, gasmask topped by a shock of dayglow red hair. Two of these props were quickly discarded as the first line of 'Sleepers' lyrics neared. The hall began rather emptier than one would have hoped for such a long-term opening act (due in part to a motorway accident on the M40) but by the time the band were into their third oldie, the classic 'Room 801', the hall had filled to a reasonable degree. With some familiar songs getting the audience livened up in the first half of their hour long set it was time to launch into something a little less well known, excerpts from their new opus 'Year Zero'. Music from this album was first played an hours drive from the festival almost two years ago but it has taken until today for the final recorded version to be released. In fact the release was as much a surprise for the band as the audience as an initial batch of prerelease copies arrived that afternoon. As the initial wash of keyboards swept through the hall the venue was heating up and it remained that way for the rest of the weekend. I have a feeling that the sections played tonight differed from the earlier show but with just the vague entry of Year Zero (exceprts) on the setlist it is hard to know. 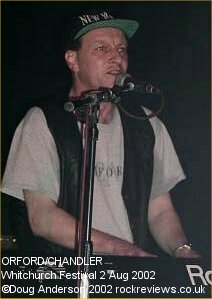 Musically the piece varied from Dean Baker's delicate keyboards to meaty guitar breaks from Roy Keyworth (wearing a Cardiacs T-shirt in homage to last years festival) topped by the energetic tambourine playing of Stu. The rhythm section of Peter Wallbridge (bass) and Spencer Luckman on percussive devices kept things bubbling along towards the finale - a final choral crescendo. As this was preprogrammed the band were free to congregate stage front and fire a salvo of party poppers at the audience as the lights finally shone bright and white rather than the dim green, violet and red that pervaded the set. 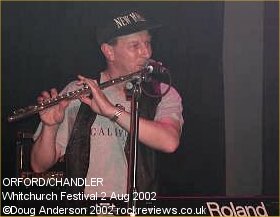 Next up was festival regular Martin Orford who didn't require much set-up time having just one keyboard and a flute equipmentwise. 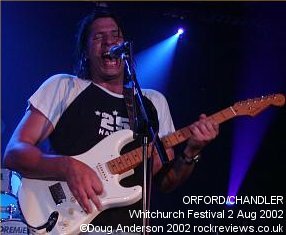 On the web the set had been advertised as including fellow Jadis man Gary Chandler though there was no sign of him during the first three tracks. Opening with IQ's 'No Love Lost' and a new and untitled piano piece that Martin hoped would have an end by the time he reached the conclusion of the piece the audience were paying attention from the off. After 'Speak My Name' Martin mentioned that " this is point where I normally pick a member of the audience." 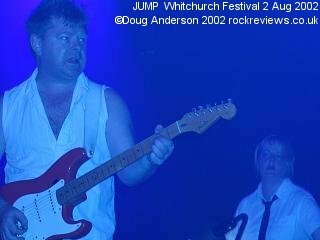 Obviously Gary Chandler was awaiting his cue as he almost immediately stepped up from the audience, picking up a white Stratocaster and addressing the audience in his normal casual style. During a Jadis medley he broke a string and while he fixed it Martin decided to fill the gap with a "bit of the 'Last Human Gateway'". Back with a new guitar it was time for a song "older than me" as Gary introduced 'Follow Me to Salzburg'. Unfortunately, new strings require tuning and this preceded the song along with some odd waffling about Salzburg pies. 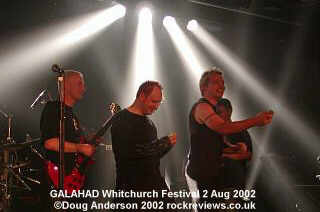 One from Martins solo album was announced by Gary but soon corrected by Martin. Gary explained his printer didn't print large enough for him to read before sticking with Jadis for a little longer and 'Giraffe Chariot'. Gary then managed to introduce the correct song though he asked Martin to pronounce the album title. Instead, due to a misunderstanding Martin just purposefully mispronounced the track as 'Evensnog'. As with most of the set this was a gentle tune that began with Martin on flute backed by some samples before he switched to keyboards and eventually Gary joined in. With the briefest of pauses the pair switched to the long repeating introduction to 'As Daylight Fades' in which Gary broke another string on his second guitar. With no more guitars or strings available he was forced to busk the remaining tracks after being goaded by Martin to Sellotape the string back together. The strings even made it into the song introduction care of a quick thinking Martin, "'Where in the World' can I buy my strings?" Martin handled what would have been a guitar introductory section due to the string problem with Gary just strumming along. Drawing their forty five minute set to a conclusion Martin decided that they weren't going to bother with "all that encore stuff" and instead introduced the only cover of the set, a track by the Alan Parsons Projact, 'Old and Wise'. Despite the obvious handicap of a ham-fisted guitarist the almost local duo went down well very well as the crowd continued to build for the main event of the evening, returning heroes Jump. And so to the headliners. 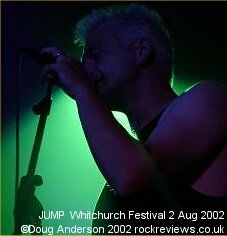 Last year Jump played support to Perfect Alibi, a south coast Pink Floyd tribute band, and since then vocalist John Dexter Jones has made much of the fact that this year Jump were going to put on a better show than the papier mache pig that hovered above the stage last year. 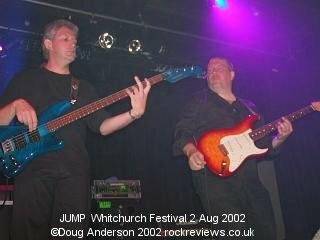 In fact their website even promised "Look for a HUGE surprise in the show at Whitchuch....the visuals will be spectacular..."
Well, on the night nothing happened in the way of stage props but there were a couple of other initial surprises, both in the barnet department. First onstage though possibly less noticeable was the now almost shaven head of Steve Hayes. This paled to insignificance when Mr. 'look at me' Jones walked onstage with short bleached blonde crop of hair. He made a bit of a show of the new look but I can't help but think that the new look was lost on the vast proportion of massed faces. With the visual shock of fading the music took over and the double salvo of rockers 'Dr. Spin' and 'Judgement Day' waking everybody up and drawing in any still out in the beer tent. Paying homage to the guitar work of Steve Hayes and Pete Davies in these songs JDJ 'played' a few bars of air guitar before wondering if "there's 'Poison in the Sea'? With all the exertion and the stuffy heat of the hall by the time they wondered at the 'Moscow Circus' Jonesy was already mopping sweat from his brow. A pause in proceedings allowed time to explain the lack of promised 'spectacular visuals' and that instead more realistically he had "entertained designs of bringing a small pink crochet pig". This led into an anti-Pink Floyd cover and rant that possibly was lost on many of the audience not present the previous year. Forging his own way 'Alone Ahead' the lyrics became more personal with a tale of his homeland "and the sleet and the rain" in the slate quarries of 'Bethesda'. Unfolding a sheet of paper it seemed likely that some of the newer songs from the forthcoming album were to follow. Well, not quite yet as 'All Hail' was preceded by talk of Old Speckled Hen and 'The Pressed Man' though tonight there was no hangman's noose of hair to be used as a prop by the frontman. 'Blind Birds had some harmony vocals during the choruses, initially alternated between guitarists and finally augmenting the sound with all three together. More new material followed in the form of 'Fresh Young Thing' and the "Sliding Doors song" 'Different Story Now' which featured some soul bearing about the Jones youth. A funky riff from Pete meandered then stopped before switching to country mode for a song written for Mrs. Jones, 'Love Song Number 5'. 'The Freedom Train' picked the tempo up again before a slightly miffed JDJ boasted that he was the "voted best singer in the Classic Rock Society two years running until someone called Damian Wilson knocked me off." However, showing an surprising honesty he added that after playing one of his CDs "I didn't feel so bad." Another Wales related tune followed in the form of the rather groovt 'Home Song', again due to be included on the next album. The lights dimmed as the menacing riff to "a song about pursuit, about fear" cut out from the PA. 'Like A Drum' was possibly the hardest rocking song played this evening - and probably the whole festival - and is one of the highlights of the last album, 'On Impulse'. The power was kept high for 'Used to the Taste' which switched, care of Mo and her keyboards to dance beat before reverting to rock with a touch of Led Zeppelin and M with 'Nobodies Fault But Mine' and 'Pop Music'. Never let it be said the band doesn't cover a variety of material in their set. 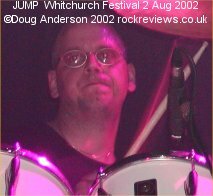 Before proceeding to the final track the band were amusingly introduced, the remaining members of whom are drummer Andy Barker and fellow rhythm section member (and Andy) bass player Andy Faulkner. The set climaxed with the beautifully played 'Keep the Blues' into which just the merest hint of Floyd's 'Shine On You Crazy Diamond' was slipped. Time having flown by there wasn't much time for an encore but an audience favourite in the form of the only full cover of the evening, 'Sweet Home Alabama', and the thrashing guitar of Pete brought the show to a fitting climax. So, a few minutes shy of a two hour set, the exhausted band left the stage after the solitary encore to rehydrate and head off either on holiday or home to worry about completing the next album. 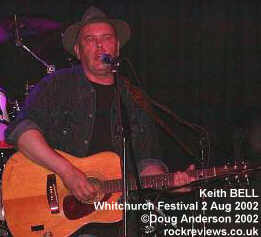 Keith Bell quickly appeared to remind us that more music was to follow over the weekend. As I gathered my camera gear I thought that the rest of the festival would have some way to go to beat tonights bill. The festival continued over Saturday and Sunday and you can continue the overview here. This page is Copyright © Doug Anderson 2000 - 2002. Created: 02 Aug 2002. Last updated: 8 August, 2002.